http://newiprogressive.com/images/stories/S5/foxconnwisconsin-s5.jpg Deal’s Constant Changes Doesn’t Bode Well for Wisconsin Workers. “Almost has soon as the ink dried on the Wisconsin deal, Foxconn started walking back their promises. Immediate reductions in screen sizes, hires, Chinese workers instead of Americans, plant operations, assembly workers, and on and on. The only thing that hasn’t changed is that this has been a bad deal for Wisconsin since the start. At some point, Republican leadership needs to admit, plain and simple, they got played. While Donald Trump, Paul Ryan, Scott Walker, state Republicans and even Kanye West were extolling the virtues of this deal, they chose to ignore what was staring them in the face. This is a company that has a well-documented pattern of “bait and switch” tactics. The writing was on the wall. Yet Walker and crew, with an eye on re-election, chose to look the other way. And for Speaker Vos, to imply that a change in the Governor’s office is justification for Foxconn’s outright lies to the residents of this state, is ridiculous. 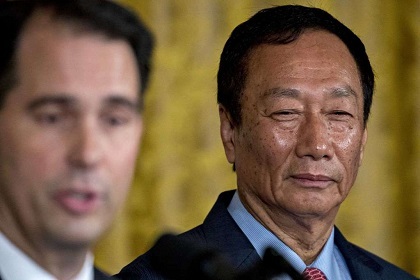 It also doesn’t fly, since again, Foxconn started reneging on aspects of the deal while Walker was still in office.